Udupi, May 11, 2016: Speaking to media, Parish Priest Fr Sunil Veigas detailed that Udupi diocese Bishop Rev Dr Gerald Isaac Lobo will dedicate and bless the new church. The Bishop will offer the first Eucharistic Mass Service in the church joined by priests, nuns, and thousands of people. The St Francis Assisi Church in Tallur has a history of 87 years. There was no prayer centre for Christians in Tallur region before 1928 and they had to go to Holy Rosary Church in the town to offer prayers. Following a request from the devotees to set up a separate church at Tallur, Rev Fr Peter D’Souza purchased a piece of land in Tallur in 1928 and constructed a small shed.The Christian community in Tallur went on to construct a new church in 1959, he added. A total of 19 priests have served in the church and Rev Fr Sunil Veigas is the present parish priest of the only church dedicated to St Francis Assisi in Udupi and Mangalore dioceses. A total of five villages come under the jurisdiction of this church, Tallur, Uppinakudru, Hemmady, Devalkunda, and Hattiangadi. About 896 members spread over 220 families in these villages are served by this church. This church is located in the central part of Tallur and is known as a centre of harmonious coexistence. 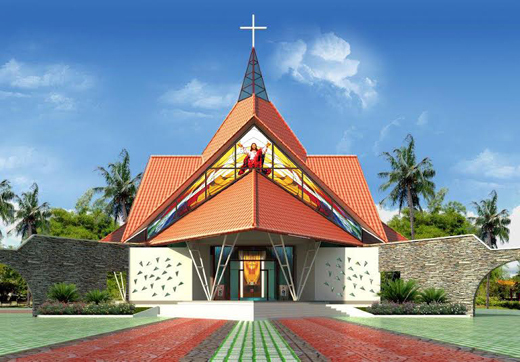 The new church building has been built at a cost of over Rs 3.5 crore. It can accommodate 600 devotees to offer prayers together. ’Shilpi’ architects based in Kerala have designed the building. The church has entrance from three sides with similar doors. The windows allow good light and ventilation in the building. The building is 140 foot wide and 113 foot tall with a total area of 10,800 square foot. A large altar has been erected. The church building resembles a star that has been placed vertically in the elevation. For the Christian community, star is symbol of hope. Before the birth of Jesus Christ, wise men saw him descending in the form of a star. Glass is used for the 40% of the building and modern monitor tiles have also been used. Granite slabs have been used for flooring. Marble statues of Mother Mary and St Francis Assisi would be installed on left and side of the altar.